The Future Champions Program will transform your child into a confident and motivated teen. Our dynamic Champions instructors build confidence in our students, and prepare them for life. On the mat students will be inspired and motivated, and instructors will build values that will transcend into success. 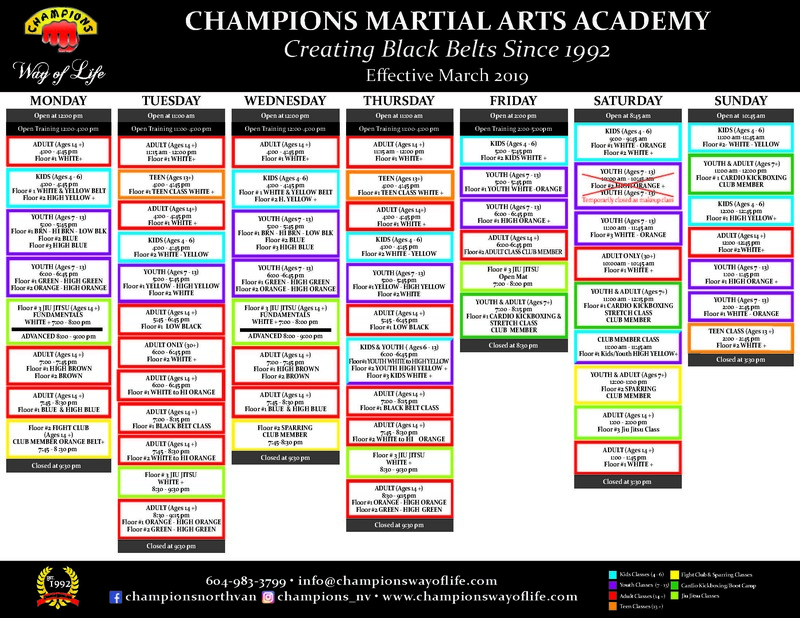 If you are looking for your child to increase confidence, focus, self discipline, or any other of the Black Belt Principles taught at Champions, then call today and let the transformation begin. As students progress through the Champions Belt System, they will be involved in community projects, and instructors will review their report cards to make sure they are achieving the Champions Edge in life. The Champions Edge teaches children to be well rounded, and Champions Instructors reiterate the importance of school work, family life, and our responsibility to the local community. Our high school program is targeted at teenagers who are looking for more than a regular workout. Combining an exciting and encouraging atmosphere with our curriculum of kickboxing and self defense, high schoolers are sure to have the time of their life while getting physically fit. We focus primarily on the high-fight burning and body toning exercises of kickboxing, while we incorporating a more practical self defense approach to increase confidence in uncomfortable situations; we also focus on mental discipline to avoid the easy way out. The Champions program has proven to be a successful transition for students from the mat to the class room, often times, helping students with time management and self confidence thus, performing better on exams and achieving higher grades. For the physically fit teenager, the core strength, coordination and flexibility developed at Champions has proven great for injury prevention. For the artsy teenager, Champions encourages ideas by teaching leadership and awareness, while allowing them to explore their creativity through various activities and groups such as our creative forms (kata) and internationally renowned demo teams. Our curriculum covers specific exercises targeted at improving our students' knowledge and allowing them to work within their strengths, while not neglecting their weaknesses. For the shy teenager, the Champions program focuses on self confidence and courage. Our positive role model instructors continuously mold students from being passive to self confident and socially interactive individuals. Champions operates under one simple philosophy, "There is no I can't, only I can." For the under achieving teenager, Champions focuses on getting students motivated. Champions employs only the best role model instructors to motivate and guide students away from mediocrity and down the path of success. Whatever your reason for wanted to start martial arts, Champions is the place for you. Call us today at 604.983.3799 to see how you can get started! Need more information on our Children's Program?